We started our team meeting at SAY Detroit last week with good news updates from the week. It’s a good way to remember and celebrate together the good things that are happening at the center or in our team’s personal lives. Mr. and Mrs. Hayes with Xavier, Chaderra and his second birthday balloons. 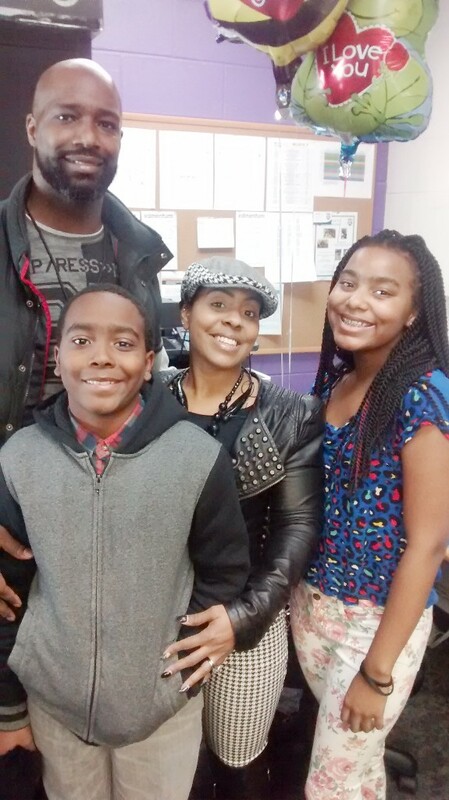 Sure enough, not long after our meeting ended, Derrick’s wife, Chanese and their two children, Chaderra and Xavier, came into the center with balloons and homemade cookies to celebrate Derrick’s second birthday. On February 12, 2005, Derrick was a Detroit Police Officer responding to a call about a cell phone stolen at gun point from a woman in a McDonald’s parking lot. Derrick and his partner were in the neighborhood and spotted a person who fit the description. When they approached him, the suspect ran into a backyard with Derrick close behind. They leaped fence after fence, crossing streets and cutting through backyards for a quarter mile before Derrick finally got close enough to bring the suspect down in the backyard on a street he wasn’t sure of. It was dark outside, and the other officers had lost track of him in their cars. With one knee in the back of the suspect and his right hand on his gun, Derrick lifted his left hand off of the suspect’s back long enough to press the button on his radio to call out to his squad car. As he did, the young man squirmed to his left and freed up his right hand, twisting over just enough to begin shooting Derrick. Two bullets hit him in his vest, and four went into his legs and abdomen, before Derrick fatally returned fire. Derrick was about to lose his life because of a stolen cell phone. How many times have we read that headline in Detroit and shook our head in despair? But the ending to this story was different, and that was Derrick’s good news last week. He was given a second life to celebrate. It has not been easy. Recovery took years. He gained almost 100 pounds. He became depressed. Bills piled up. When he finally got healthy enough to go back to work, he found a job as a substitute teacher at University Prep. He had a good way with young people and worked his way up over the next few years to become Dean of Culture at Southeastern High School before becoming our director of culture and partnerships at SAY Detroit. His wife and kids were with him through it all. You can find them together still. His wife and daughter work concessions at our basketball games on Saturdays, while he coaches and his son plays on one our teams. You might never have known the years of pain and trials they have gone through. But you can see the joy of their victory when they are together, and especially on February 12 every year. 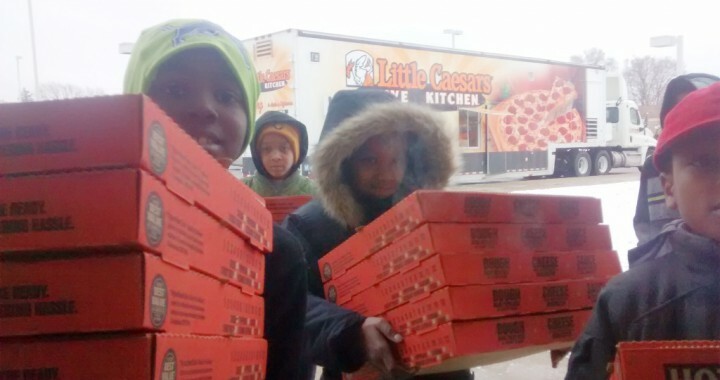 Our youngest members carry pizzas to the Volunteer Appreciation dinner. 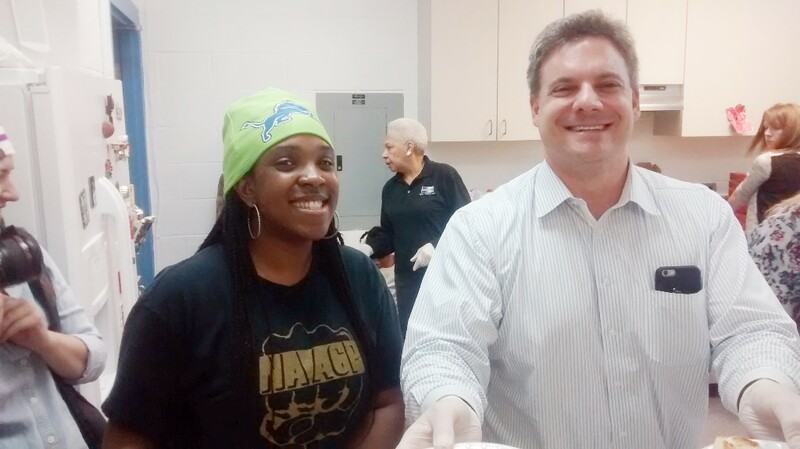 Our own Jenell Mansfield serves pizza with Little Caesar’s CEO, David Scrivano. 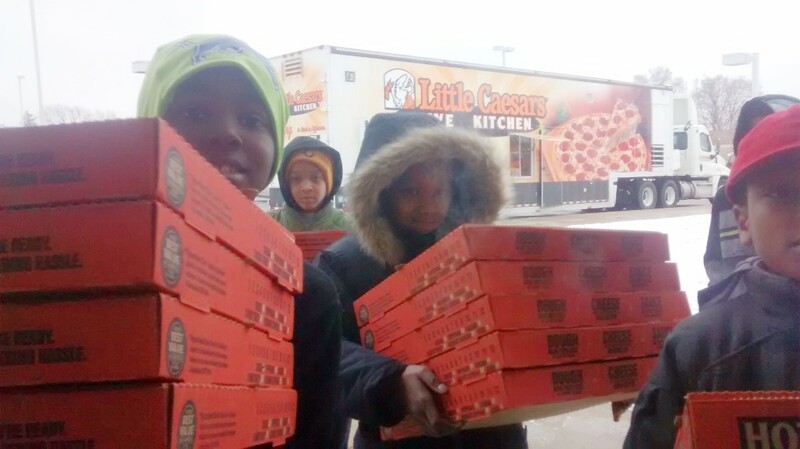 Much thanks to Little Caesar’s CEO, David Scrivano, and the Little Caesar’s Love Kitchen for a great night of fun and Hot and Ready’s to celebrate our volunteers on February 16, 2016.